Today Holy Mother Church calls to mind St. Ephrem of Syria. According to legend, St. Ephrem may have been the son of a pagan priest. He was brought to the faith by Saint James of Nisibis and baptized at age 18. 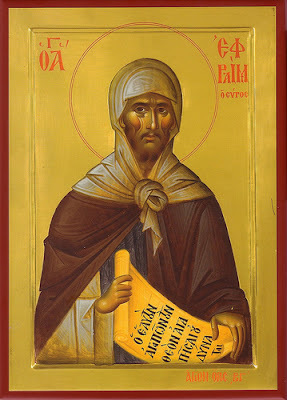 St. Ephrem helped to evangelize Nisibis, Mesopotamia. He may have attended the Council of Nicaea in 325. He was a renowned Deacon and Preacher, who had a great devotion to the Blessed Virgin Mary. In 363 Nisibis was ceded to Persia and a great persecution of Christians began, and Eprem led an exodus of the faithful to Edessa, where he founded a theological school. He wrote homilies, hymns and poetry (see his Lenten Prayer). It was he who helped introduce the use of hymns in public worship. St. Ephrem helped fight Gnosticism and Arianism by his writings, including poems and hymns. He was proclaimed a Doctor of the Church in 1920. O God, You added glory to the Church by the brilliant learning and outstanding merits of Your blessed confessor and doctor Ephrem. Defend Your Church against the dangers of sin and error, through the intercession of this saint. Through our Lord . . .